Homemade toys don’t have to be fancy. For young toddlers, sometimes the simpler the toy, the better the play. 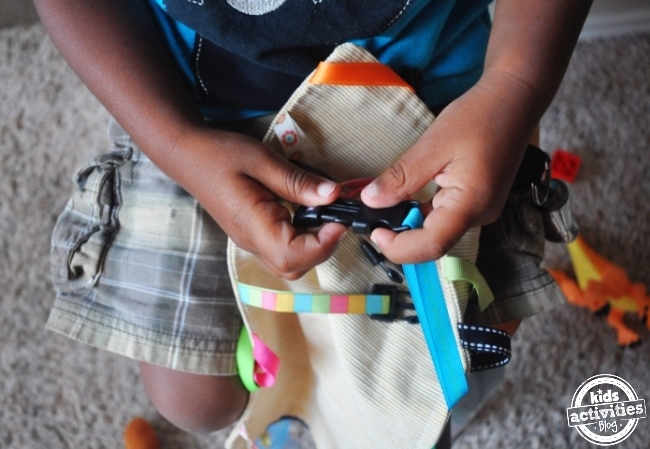 This DIY buckle, clipping toy kept my toddler (17m) entertained for hours! I was inspired to make this one morning at the park, when all the other kids were playing with the slides and the swings and the two toddlers at the park were hunched in deep concentration over a stroller, buckling and unbuckling the straps. This is a great addition to our activity bag, especially as we were anticipating a long cross-country road trip. I am so thankful we made this, this and the “I Spy Shaking Bottle” were two of the toys that held my daughter’s attention! 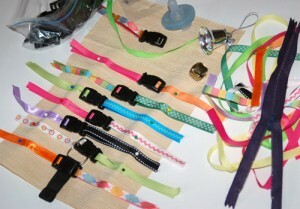 Other fun items (we added a pacifier, a bell, a key-chain, a zipper. I can also see this being a hit with various sizes and textures of Velcro). First, I threaded the buckles through the ribbon and affixed them to the right side of the fabric, or the side I wanted to be visible. Then, I pinned the other piece of canvas (pretty side in) and sewed along the edge, leaving one side open, like a pillowcase. We clipped the corners and turned the “pillowcase” inside out. 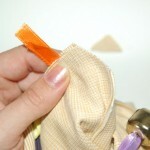 Now the buckles, which had been pinned on the inside of the two pieces of canvas, are on the outside. I reinforced the seams with another straight stitch along the outside, added a zipper and viola! I love homemade toys. Our toddler has had hours of fun clipping and unclipping these buckles! I want some buckles!! This is the PERFECT toy – somehow, strangely occupies them, while working on those fine motor skills!! I can’t wait to make one of these for the car. Hooray! I just salvaged a buckle from an old bike helmet. 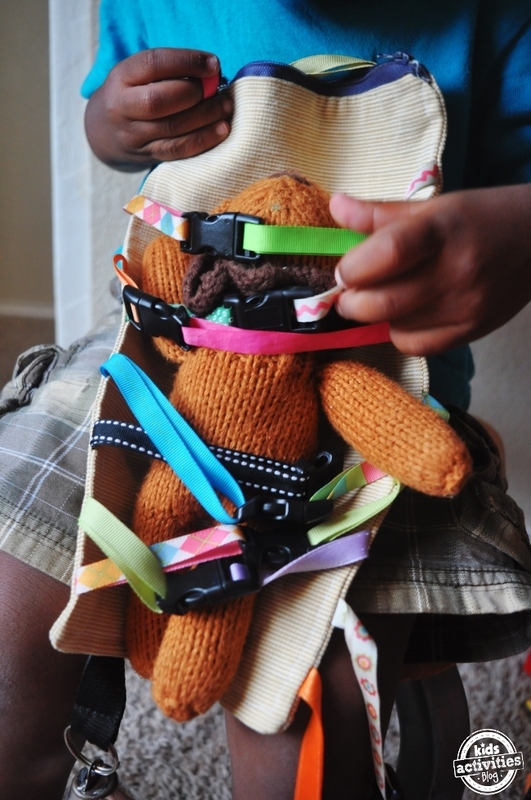 What a great way to use buckles! That turned out great! Very clever! .-= The Activity Mom´s last blog ..Letter Font Sort =-. I would love some buckles. This is brilliant. Would entertain my daughter forever and make a great 1st birthday present for my niece. This is such a great idea, Emily loves practicing doing those buckles! This is a great idea. I’ve actually seen those buckle stuffed animals, they retail for around $30. I never thought of trying to do it myself! I was actually blogging about road trips this morning too. If you have buckles left over after you send the other ones out, I would love some!! .-= Christine´s last blog ..Menu Plan Monday, it’s back! =-. I passed this on to my friend Shannon and she offered to make me one. I love your site- i visit “for a quick look” and always end up staying for ages! This is such a brilliantly simple idea. Thanks for sharing it. .-= Amaria´s last blog ..Magnetic Wooden Dolls, complete family =-. Would love buckles to make this! We have a long cross country plane trips coming up and I think it will be a rough one (will be on my own for 3 of the flights with our toddler). Last trip as a lap child too so will definitely be tight with an active guy. He loves playing with his car seat and stroller buckles. This is so brilliant! I can’t wait to make one of these for my mechanical little guy (21 mo.). .-= Wendy´s last blog ..Project 365 2010: Week 17 =-. Just hopped over from ParentHacks. I love this toy, it’s so simple and clever! And I would love some buckles so I can try my hand at it. Thanks for sharing. I have been working stuff out like this in my mind. My son is only 13 months, but I would love to get started now so it is ready when he is. I am also looking at your activity box/bag. I have seen so many cool “quiet books” but I thought I would rather make a few pages at a time, so I am going to get a canvas tote and make things to fit in it. Thank you for sharing this. I made one but took some liberties with your instructions because I don’t follow directions well. 🙂 I also added a strap to hold it closed. I love this!! My son is 21 months and would adore this! Do you have any buckles left?? I would appreciate them so much! .-= Ashley Scheffler´s last blog ..Over the top challenge =-. I love to sew, and I think my grandson would love this. He lives In Africa and is 18 months old. He has spent many hours on airplanes. I think his folks would find this toy very useful. Please send me some buckles if you have any left. If not send me the link where I can get more. Yes, I would love a few buckles to make this. Thanks!! I am so not crafty! Could I buy one of these buckle clipping toy pre-made?? We have a 6 hr plane ride coming up in Aug.
Ah! This is genius! Now I just need to see if I can come up a quickie version for our trip tomorrow! this idea is so great! my son is obsessed with buckles too. i made one andjust he loves it!! i added a zipper so it can hold his little cars and things. Great idea! My toddler is obsesse with these too. I added your post to my link roundup this week at my blog. Thanks for sharing! its a great concept, but these clips will teach my daughter to open a whole new world of things she cannot get into now, and she doesn’t need to!!! This is a great idea. My son Josh loves buckles but I am not good at sewing so I just checked online and found a few companies that sell them pre-made. Both are made by moms. I am going to order Bucky the turtle for my sons Christmas present. Can you tell me what size buckles you used? 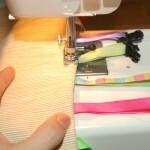 Or what width or ribbon is easy to find in lots of colors? My 22 month old used to love the tag towels. This looks like it should keep him out of trouble. Thanks for this great idea! ….nice one! I will made one for my niece and she’s 5 months old and she loves grabbing something she holds. I will try it because it looks easy to make. I’m sure her mom will be happy about it. Such a genius! With your keen sense of observation, you have found ways to keep toddlers concentrated on one thing for a long period of time. Kids are naturally curious, hence, they would love such activities. What a great idea…and so easy even my wife can do it. (shhh, I didn’t say that) Thanks for sharing! Very Nice idea.. I want to learned that! I’m looking forward to make that kind of Road Trip Sanity with a Toddler. I want to share this information to all my friends, to make us more!! I’m so thankful to find this site!! Thank you. This is awesome. 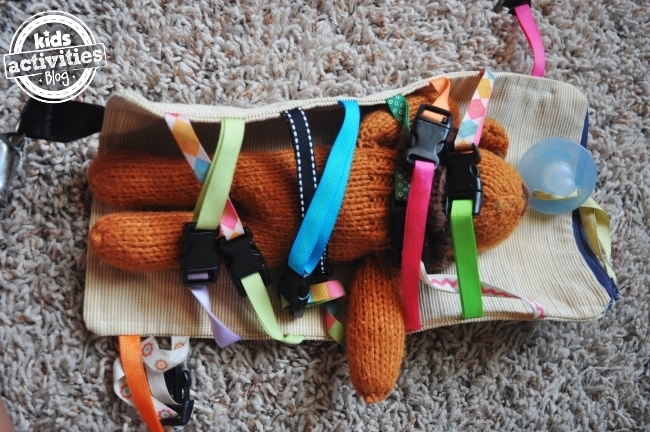 My daughter is totally into stroller/car seat or anything that has buckle or zipper. Great toy. I love this!! My 19 mo old spends most of her time buckleing her stroller and highchair buckles. All day long she will sit there and do it over and over again. I think Im going to give this a try! This is really really cool! Question – how good of a sewer do you need to be to pull this off successfully? I’d give myself a 4/10 when it comes to skill with the needle and thread! 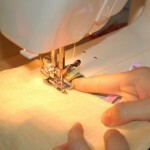 I love the idea… but the problem is, I don’t know how to sew.. any ready made products of this for sale? if yes, where can I buy it? Thanks! I really don’t have this kind of talent. I mean, I don’t have this innovative mind when it comes to household stuff. This really is a super idea. I have seen those stuffed animals, they sell for 29.99 – I actually blogged about it too. If you have any buckles left after you send those ones out, I would really love some!! i am serious, your idea worked perfect. This is so totally amazing! I really can not wait to actually make one of these. It should be really fun! I do know I ™m just a little late in contributing my concepts but this particular write-up made me believe. It was an absorbing weblog post. Great learning toy for kids. Thanks for sharing. Keep sharing more and more. This site is awesome..I like this site..My brother 4 years old also like this thanks for all. @Rachel, Do you have any demonstration video on how to do it? Hi Rachel, nice work! I will try this at home. Thanks! YES! you can create your own, and have you own design too what ever you want to do. Same here, Better to have demonstration video. This is nice! I like doing things in my own. I actually made a bracelet using a thread and it’s really nice. Homemade is the best. You can create your own design and style. This is a multi-purpose toy because besides that it will make fun to the kid. it also enhance their motor skills for a better growth. Wow. This is very nice. And the fact is that you can create your own style and design. Thanks for sharing. What size are the buckles? I’ve ordered two different sets, and they were too small and then too big. 🙁 So excited to make this toy, though! So great. It’s amazing how we create these wonderful looking toys and pay top dollar for them when really, all I ever had to do for my kids was to open up my tupperware cupboard! I’ve stopped buying toys for my little ones and they have gotten very creative with whats around the house! Thanks for sharing too! Ha! I hadn’t thought of this.